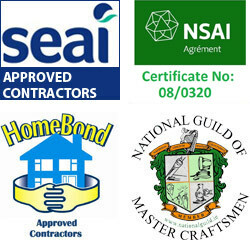 If you are keen on Home Retrofitting in order to make it more energy efficient you may also be eligible for substantial grants and concessions from Sustainable Energy Ireland. A National level Home Energy Saving Scheme will be implemented from 2009 onwards. The target is 1million houses nation wide. Your “not so new” home too could be one of them. What aspects of home retrofitting deserve your attention for improved energy efficiency? Are all these aspects considered for HES subsidies? All the above are important considerations in energy conservation to a greater or lesser degree. But for concessions and grants under HES program all these are not taken in to account. For home for energy efficiency in what way the above items become significant? Currently if your Home Heating System uses Gas or Liquid Petroleum fuels the efficiency may be high. If not repair or replace the equipment with environmentally friendly Wood Pellet Boilers or stoves, Gasification type Boiler or stoves, Air to Air Heat pumps, or geothermal energy systems. Ventilation is important in maintaining the Indoor Air Quality. Every bit of Fresh air brought in affects the Humidity, Temperature and the Heat Load. Precise regulation and incorporating heat transfer wheels will save energy. The use of electricity is efficient but very expensive. Replacing them with solar thermal units, Heat Pumps, geothermal energy, wood pellet burning and gasification boilers, will provide cheaper alternative sources which are also more sustainable. 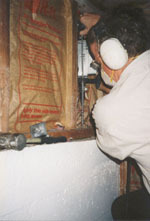 Attic insulation, Exterior Wall insulation, Exposed Floor insulation, crawl space insulation etc are to be looked into. A wide variety of insulations such as Fiber Glass wool, Rock Wool, Slag Wool, Cellulose, Cotton etc are some of these. The durability, fire resistance, vermin and rodent resistance, settling resistance are aspects to be considered. Air leaks to a new or old home through small crevices around windows, doors, roofs, pipe and duct penetrations etc. depending on the outside air velocity the uncontrolled air flow in to the home will be considerable. It brings in Heat, Moisture, Pollutants and Dust. Sealing these is therefore important to conserve energy. It may advisable in old houses to replace the Skylights, doors and windows for improved energy efficiency. Double glazing the windows and doors with low emissivity or Argon filled glass. Reduce heat loads. Water Pumps consume a considerable amount of electricity. Oversized pumps, incorrectly selected pumps, incorrectly designed piping and distribution systems may increase energy wastage. Use of CFL lamps and LED lamps reduce the power consumption which generally makes up about 25% of the consumption. Use of PV solar panels and arrays for out door and pathway lighting reduce dependence on utility grid as well. How will King Group CES assist you in the above? Information and guides for application and obtaining HES subsidies. Arranging authorized BER assessor’s services etc. Design, supply equipment and install sustainable Domestic hot water systems for energy efficient homes. Design, supply and install sustainable and efficient lighting systems using solar panels, CFL and LED lamps. Automation of these systems for optimum performance.